Wisdom Of The Elders, Washingtom D.C. I have been thinking of contacting you about this opportunity. What we are looking for is to have three wise elders to make a presentation at the annual American Public Health Association meeting in Washington D.C. in November. It would be on Tuesday, November 9, at 4:30 p.m. This session is being sponsored by the American Indian/Alaska Native/Native Hawai'ian Caucus so the 3 elders would represent each of the 3 groups. You would represent the American Indian group. Please let me know today or tomorrow if this is something that you are free to do or agree to doing. As I was asked to submit a bio-sketch, I took your story from your website. Please let me know if this is alright with you. Throughout indigenous communities, Elders are accorded a central role as the primary source of cultural knowledge. It should be understood that the identification of "Elders" as culture-bearers is not simply a matter of chronological age, but a function of the respect accorded to individuals in each community who exemplify the values and lifeways of the local culture and who possess the wisdom and willingness to pass their knowledge on to future generations. Respected Elders serve as the philosophers, professors and visionaries of a cultural community. As one of the primary sources of traditional cultural knowledge, Native Elders bear the responsibility to share and pass on that knowledge in ways that are compatible with traditional teachings and practices. One of the greatest strengths of indigenous communities is the reliance placed on the wisdom of Native Elders. Elders continually remind us that we cannot separate the understanding of natural phenomena from the deeper knowledge that we are all spiritually connected to the earth and earths creatures. The native worldview defines health as a balance of the physical, mental, emotional, and spiritual aspects of an individual or group being. 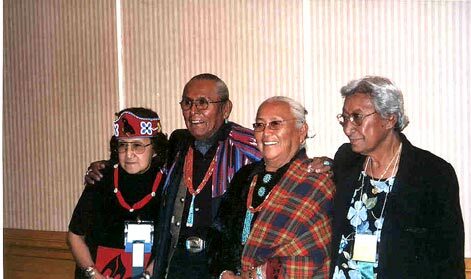 Elders provide advice in the area of health, medicine and other lifeways. Many elders teach from the medicine wheel or use sacred objects from Mother Earth to convey traditional cultures. Many use Traditional Medicine as complementary to modern Western Medicine. Public health program are increasingly utilizing the teachings of Elders to improve the health native populations. Learning Objectives:  Identify ways Elders help formulate, document and pass on traditional cultural knowledge for future generations.  Understand how the use of traditional ways of knowing, teaching, listening, and learning contributes to passing on cultural knowledge to others in the community.  Discuss appropriate traditional protocols to be used in the interpretation and utilization of cultural knowledge in public health programs.  Discuss the Elders role to assist members of the community to acquire the knowledge and skills needed to assume the role of Elder for future generations.  Discuss how Elders assist Native communities in learning the skills needed to improve the health of individuals, family and community. November, 2004 in Washington D.C.